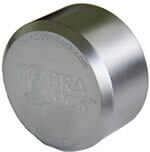 The Cobra ALUMINUM "Universal PUCK" Padlock was designed to accept the Cobra, Medeco and Abloy vending lock cylinders. The padlock body is constructed of Machined Aluminum and has no visible shackle to cut, drill or attack. The lock cylinder is changeable by the end user. This means that as the user changes the lock cylinder the security changes also. The ALUMINUM Universal PUCK Padlock has been awarded a U.S. Patent and when combined with a patented lock cylinder it increases the security and key control over standard PUCK padlocks. Click here to see our You Tube video----It show you how to change the lock cylinders. 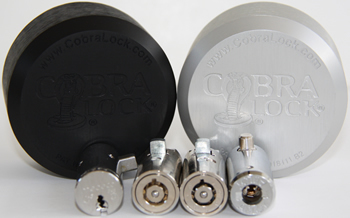 The Cobra STEEL"Universal PUCK" Padlock was designed to accept the Cobra, Medeco and Abloy vending lock cylinders. The padlock body is constructed of solid hardened steel and has no visible shackle to cut,drill or attack. The lock cylinder ischangeable by the end user. This means that as the user changes the lock cylinder the security changes also. The Universal PUCK Padlock has been awarded a U.S. Patent and when combined with a patented lock cylinder it increases the security and key control over standard PUCK padlocks. Click here to see our You Tube video----It show you how to change the lock cylinders. The Cobra "FLEX®" Padlock is constructed of solid hardened steel and comes with either a one inch or two inch hardened steel shackle. Our "FLEX®" padlock allows for standard 7/8" cam locks to be installed by the end user. 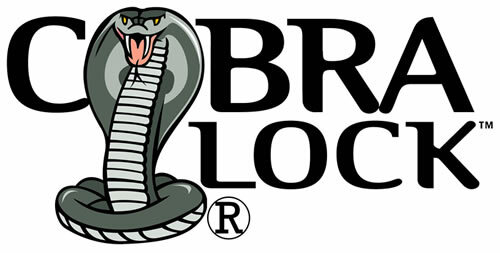 The FLEX® body will accept lock cylinders from Cobra Cam Locks, Medeco and Abloy. Awarded U.S. Patent. The Cobra Flat-Back Standard PUCK Padlock is constructed of hardened solid steel, with NO visible shackle to cut, drill or attack. The lock cylinder is standard flat key designed to be compatible with the American or Master PUCK padlocks. This Lock is custom assembled, so it is your choice of keying (keyed alike or keyed different). If you send in your current American or Master padlock key we will be able to make these padlocks operate wilth your keys and our keys work with your current padlocks. 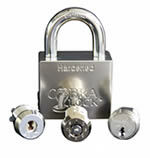 The Cobra 8200 & 8220 Series Padlocks are both constructed of hardened solid steel with hardened steel shackles. The body size is 2 3/8" wide by 2" high by 1" thick. They come with user changeable shackles. The Cobra 8200 and 8220 come with industry standard lock cylinders that are comparable with American® and Federal® padlocks. The Cobra 8100 & 8120 Series Padlocks are both constructed of hardened solid steel with hardened steel shackles. The body size is 2" wide by 1 1/2" high by 5/8" thick. Both come with user changeable shackles.